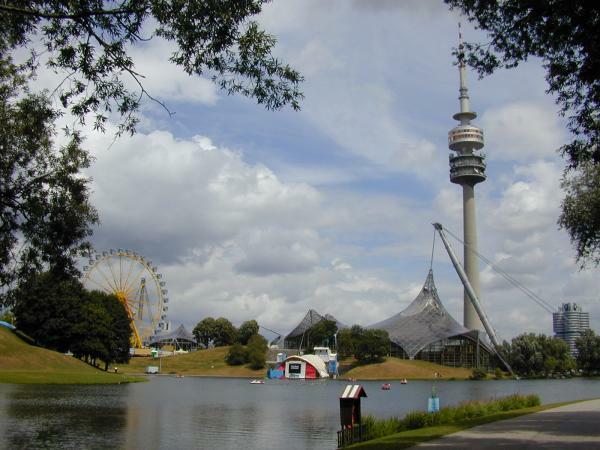 Built for the 1972 Olympics, the landscaped Olympic Park Munich still contains sport facilities, lakes, bicycle paths, concert venues, restaurants, a football stadium, and a TV Tower. Its landmark is the "tent-style" roof of the Olympic stadium. Right across the street of the Olympic park lies the fascinating BMW Museum and the company's headquarter. It was constructed in the characteristic shape of a four-cylinder engine. The Olympic Tower has a height of 290 m (951 feet) and is Germany's highest television tower. Located at the Olympiazentrum, it is possible to go up the tower by elevator. On top you can enjoy a marvellous view of all sights and points of the city, and the alps. In summer it is open for public. You can enjoy a good view of the city skyline from the top of the statue. Inside its head is a viewing platform.